Aims and objectives: The aim of the study is to determine the pathophysiology of inflammatory diseases and to gain knowledge of the possible factors that triggers of the inflammation, which may open novel therapeutic approaches. Materials and methods: A total number of 100 subjects with age range of 45-60 years were selected for this study and were divided into four groups. Group-I(control) which consisted of 25 individuals, who were free of periodontitis, rheumatoid arthritis, and coronary artery diseases. Group-II which consisted of 25 individuals, who were diagnosed with periodontal problems (probing depth 5mm), Group-III which consisted of 25 rheumatoid arthritis individuals, who were diagnosed without prior use of disease modifying anti rheumatic drugs, Group-IV which consisted of 25 individuals, who were diagnosed angiographically proven coronary artery disease without prior use of drugs were selected. A biochemical study of inflammatory markers (fibrinogen and C reactive protein, lipid peroxides), antioxidant levels ( -tocopherol, ascorbic acid, reduced glutathione and ceruloplasmin) and lipid profile (total cholesterol, low density lipoprotein, high density lipoprotein, and triglycerides) were carried out in all patients and these results were compared with control. Results: Inflammatory markers and lipid peroxides were observed to be significantly increased (p 0.001), antioxidant levels showed significant decrease (p 0.001) and the lipid profile values were observed to be increased significantly (p 0.001) in all three disease groups as compared to normal individuals. Conclusion: Hence, the present study suggests the importance of assessing biomarkers of inflammation to determine the severity of inflammation and also to evolve targeted treatment strategies for better management of the condition. There is a paucity of research data regarding endodontic practices amongst general dental practitioners in India. The purpose of this study was to gather data on the prevalent endodontic practices by general dental practitioners in Delhi area. A questionnaire was prepared and distributed to 300 practitioners in Delhi. There were 20 questions with multiple choice answers relating to antibiotic usage, root canal preparation, instrumentation, irrigation and obturation techniques. The results show that rubber dam is not a popular method of isolation with less than 1% dentists using it. Antibiotics coverage for routine antibiotics was very high at 91.6% which is not a favourable trend. Sodium hypochlorite inspite of being an established irrigant is not popular with only 10.7% of practitioners using it. Most general dental practitioners prefer to perform multiple visit endodontics with nearly 70% not informing the patients about fractured instruments. The results indicate that the knowledge and attitude of general dental practitioners towards endodontics is poor. This survey reinforces the need for conducting continuing dental education programmes for dentists. The commonly described methods for incisor intrusion employ the same principle, a tipback bend or a V-bend in the posterior region of the arch wire. Arch wire material may be changed but all of them recognize the need of light continuous forces to prevent external root resorption. This article suggests few guidelines for the the true incisor intrusion. Moreover the various commonly used appliances for incisor intrusion have been briefly discussed. Healthy individuals are the most precious assets any country can have. For the same purpose an oral health survey is must for every country to determine the oral health status and the treatment needs of that population.Reliable baseline data are provided for the development of national or regional oral health programmes. Surveys are used to monitor changes in the levels and patterns of disease, so that appropriateness and the effectiveness of the services can be assessed. Keeping this in mind an oral health survey was planned to assess the oral health status of 5 years old school children attending the government school in Meerut city, Uttar Pradesh, India. Fifteen hundred children were examined, 60.2% males and 39.8% females. The prevalence of dental caries in males was 89.7%, with mean dmft of 2.63 and in females 86.8%, with a mean dmft of 2.21. The survey was done with an aim to comparatively evaluate the dental caries experience in terms of socioeconomic status with ethnic group, oral hygiene habits and sugar exposures. First performed in 1902, sialography is a radiographic technique wherein a radiopaque contrast agent is infused into the ductal system of a salivary gland before imaging providing a straight forward demonstration of ductal system. Sialography is also indicated for the evaluation of the chronic inflammatory diseases and ductal pathosis. As the incidence of obstructive salivary glad diseases is quite high, sialography provides a cost effective, relatively cheap and safe diagnostic solution that can be routinely employed as a screening procedure. This holds particularly true in areas with hard drinking water. This calls for the inclusion of a questionnaire related to obstructive salivary gland disorders in community screening camps. An attempt is being made through this article to give an overview of the technique for better understanding by the community dental specialist who plays a key role in public health services and awareness. Background: The aim of this study was to evaluate the epidemiological aspects of facial injuries in a tertiary care centre in Bangalore city. Material and Methods: Records of patients reporting to the outpatient department of oral and maxillofacial surgery of Vydehi Institute of Dental Sciences and those admitted in Vydehi hospital between September 2006- August 2009 were accessed. The data pertaining to the epidemiological aspects of facial injuries was recorded in the proforma which was designed for the study. Results: The results of the study showed that about 72.24% of the cases were due to road traffic accidents, males being affected more and the 21-30 year old age group being the most commonly affected by facial injuries. Mandible was the most affected site. Conclusion: Creating a national level database involving government and private dental colleges, general practitioners, consultants and hospitals will go a long way in addressing the issues of prevention and treatment of maxillofacial trauma. Public awareness of medical and dental negligence in India is growing. Hospital managements are increasingly facing complaints regarding facilities, standards of professional competence and appropriateness of therapeutic and diagnostic methods. The law is not made to punish all health professionals that cause injury to patients; it is concerned only with negligent acts. Medical negligence arises from an act or omission by a medical/dental practitioner, which no reasonably-competent and careful practitioner would have committed. What is expected of a medical/dental practitioner is a 'reasonably skillful behavior adopting the 'ordinary skills' and practices of the profession with 'ordinary care'. Therefore, both the professions need to update their understanding of the concepts of medical negligence and consumer protection act, and its amendments to be on a legally safer side. In our article, we attempt to outline the salient features of medical negligence and consumer protection act. The purpose of this study was to determine the symptoms and pathology associated with impacted third molar and its distribution between the jaws amongst rural population of Muradnagar, Ghaziabad. The sample for this study consisted of 348 patients, ranging from 21-35 years. The patients had a total of 436 impacted teeth and were examined for the type of impactions and associated symptoms/pathology. The results showed that 327 (75.00%) of the impactions were associated with pain, 300 (68.67%) were associated with pericoronitis, 166 (38.07%) were associated with caries and 13 (2.91%) were associated with cysts. More impacted teeth were seen in females i.e. 198 (56.90%), than in males i.e. 150 (43.10%). The results also show that when classified according 101 (23.16 %) were in position I, 283 (64.92 %) were in position II, while 52 (11.92 %) were in position III. 258 (59.17 %) impactions were in position A, 134 (30.72 %) were in position B while 44 (10.01 %) were in position C. From the above data, it can be concluded that impacted mandibular third molars are remarkably symptomatic and are associated with pathology, and may warrant the need for their removal. There is need for further studies to determine the levels of impaction, the types of anesthesia used during extraction and the outcome. Background and Objective: Dental caries is the most prevalent dental affliction of childhood and the most common cause of tooth loss in children. Even though many caries prevalence studies have been conducted in different parts of the country, still there is a great deficiency in comparative studies between urban and rural population, particularly in southern Indian states. Hence the objective of this study was to provide the baseline data of caries prevalence. Materials and Methods: A total of 1862 children of both the sexes in the age groups between 7-12yrs and 13-16yrs from various government residential schools in rural and urban areas of Guntur district were examined using WHO (1997) criteria and the data was analyzed. Results: The overall prevalence of caries in the study population was 45.91%.In rural population, 47.04% of children had caries and mean deft/DMFT was 2.637 where as in urban population, 40.52% had caries and mean deft/DMFT was 2.723.Though the caries prevalence was more in rural population, DMFT scores was slightly high in urban study population when compared to rural study population, but it was not statistically significant. The decayed component contributed maximum to total DMFT .Overall, caries was more prevalent among males and prevalence of dental caries was increasing with advancement of age. Regarding treatment needs, 50.32% of rural children and 45.52% of urban children required dental treatment for varies reasons and it is in accordance with dental caries prevalence of different age groups. Conclusion: Dental caries showed to be a significant health issue in the school children requiring immediate attention. Objective: The purpose of the study was to assess the prevalence of dental caries and its pattern in the primary dentition among five year old school going children in Shimla city-Himachal Pradesh. Materials and Method: The study was conducted on 800 school going children (421 boys and 379 girls) from twenty seven schools which were selected randomly. The data obtained was analyzed by SPSS package version 13, using proportion test for comparison. Results: Caries prevalence was higher in boys (46.8%) than in girls (41.6%) and the difference was statistically significant (p < 0.05).Caries prevalence was higher in the mandibular arch than in the maxillary arch among both the gender with a statistically significant difference. Caries prevalence was higher on left than right side in both male and female subjects the difference was not significant. When the caries prevalence of the anterior teeth was compared between the gender, boys showed higher caries prevalence than girls and this difference was statistically significant (p <0.05).Comparison of caries between the aches in the anterior segment revealed that caries attack was higher in the maxillary arch and the difference was highly significant statistically (p <0.01). Conclusion: High prevalence of dental caries among five year old school children in Shimla city is a cause of concern which point out to the utmost necessity of regular periodic check-up and application of preventive measures and treatment modalities. Introduction: With the popularity of Atraumatic restorative treatment Technique there are many number of Glass-ionomer cements introduced for the same. It is a well known fact that Glass-ionomer cements have the ability to release and uptake Fluoride which helps in preventing secondary caries. Objective: To compare and evaluate the Fluoride release and uptake between Shofu FX, Fuji IX, Ketac molar and Chemflex. Materials and Methods: Fluoride release and uptake were measured using fluoride ion specific electrode. Results: The fluoride release was maximum from Chemflex and the least from Shofu FX. For all the materials fluoride release was significantly greater immediately following refluoridation with 1000 ppm sodium fluoride solution than in the 24 hours before refluoridation. Conclusion: The use of above glass ionomer cements in "ART" technique followed by supplements is highly recommended. The general health of an individual child has been correlated with the academic achievements. There is limited data on the relationship of oral health and academic performance. The present study evaluated 308 children in the age group of 3-7 years of similar socioeconomic status for dental caries, school attendance, physical activity scores and school performance. Results showed a negative correlation of dental caries with attendance, physical activity and school performance; and positive correlation between school performance and attendance. School attendance, physical activity and school performance are minor markers of oral health status. This study was carried out to asses the pattern of sugar consumption, most common form of cariogenic food and its relation with caries status of school children in Tiruchengode, suburban area of Tamil Nadu. In this cross sectional study, about 230 children aged 11 to 14 years from K.S.R. Matriculation Higher Secondary school were participated. A five day diet diary was used to know the sweet score, AMSE, BMSE and TSE. A questionnaire was used to know the most common and preferable form of cariogenic sugars, frequency of sugar intake and also oral hygiene measures. Additionally dental caries screening was done. The mean and standard deviation of the recorded variables were; sweets score 17.15 8.5, TSE 12.16 .87, AMSE 0.69 0.57, BMSE 0.50 .66, DMFT 1.11 1.4, DMFS 1.36 1.8, deft 0.49 1.1 and defs 0.60 1.3. It was found that sticky solid sugar was the most common form of cariogenic food by quistionnaire. The correlation analysis showed a statistically significant correlation between sweets score, TSE, AMSE, the frequency of snack intake (two times per day) and sticky solid form of sugar with caries prevalence in primary dentition. It was concluded that this group of students from suburban area of India are in watch out zone and in need of diet counseling, focusing at the pattern of AMSE, frequency of sugar intake and also reducing the intake of sticky solid form of sugar. A high prevalence of dental trauma exists; its effects on function and esthetics deserve the attention of general dentists. Initial management and suitable treatment plan is difficult particularly in cases of tooth avulsion. In addition to the technical knowledge and clinical skills directed towards the quality of treatment, patient education may favorably influence the survival rate of replanted teeth. As trauma leaves a deficit in self esteem and quality of life apart from affecting the previously healthy dentition, dentists have a critical role to play in averting the psychological erosion. This study sticks out the level of awareness among general dentists regarding the immediate treatment of avulsed tooth in Nellore, Andhra Pradesh; India and straightens out the necessity for continuing dental education for general dentists. The present cross sectional study was carried out among 362, 3 - 16 year old children with different types of handicapping conditions. The data were collected using the methods and standards recommended by WHO for the oral health surveys, 1997. Dentition status and treatment needs were assessed by using type III examination procedure. Statistical analysis was conducted using SPSS software package (version 10). Dental caries was higher in handicapped children than normal children. The mean deft in primary dentition was found to be 3.74 2.34. The mean DMFT in permanent dentition was 2.67 1.69. The finding of this study demonstrates that prevalence of dental caries was highest in physically handicapped children. The decayed component constituted the majority of dental caries index. Oral hygiene status was poor in the disadvantaged children as compared to the normal school going children. Developmental disorder group children showed significantly poor oral hygiene. Among different disabled category physical handicapped showed lack of conservative approach. The results confirmed disabled population treatment needs were unmet. Hence people with handicaps deserve the same opportunities for dental services as those who are healthy. The chemo-mechanical caries removal has been introduced as an alternative non-invasive method of caries removal which aims at elimination of carious dentin via a chemical agent. A new formula commercially known as Papacarie has been launched. This method only removes infected tissues, preserving healthy dental structures, avoiding pulp irritation and patient discomfort. Instead of drilling, this method uses a chemical agent with papain gel as its active component assisted by an atraumatic mechanical force to remove soft carious tooth structure. This paper will make an attempt to highlight the advantages and clinical applications of this wonder gel. Aim: To assess the prevalence of periodontitis in postmenopausal women in rural Dakshina Kannada. Methods: The cross sectional study design was employed. 500 healthy women in the age group of 55-65 years who had attained menopause with atleast 20 teeth in the mouth excluding the third molars were included in the study. A simple proforma for obtaining general information like name, age, gender and specific information about whether menopause was attained and oral hygiene habits and any other habits like tobacco chewing was used. The information was directly obtained from the individuals and entered in the proforma. The periodontal status was assessed by CPITN index using mouth mirror and CPITN-E probe. Results: Among the 500 subjects studied, 67.8% had periodontitis which was statistically very highly significant. 47.8% women were tobacco chewers. Among the subjects with periodontitis, 55.8% were tobacco chewers. Conclusion: There is an increased prevalence of periodontitis in post menopausal women. Tobacco chewing and inadequate oral hygiene could be the contributing factors further deteriorating the condition. Aim: Gingival health maintenance during orthodontic treatment is important since healthy periodontal tissues are essential for better treatment outcome. Awareness on gingival health is important during orthodontic phase. Evaluating the knowledge, attitude, and practice on gingival health in orthodontic patients in Tiruchengode was the aim of the present study. Materials & methods: 175 orthodontic patients both males and females from Orthodontia department in simple random sampling method, KSR Institute of Dental Science, Tiruchengode were included in the questionnaire study. All participants were divided based on age groups into 3 groups as below 15 yrs, 15-18 yrs, above 18 yrs. Questions based on the knowledge, attitude and practice on oral hygiene i.e gingival health during the orthodontic treatment. CPITN recorded for all patients. All answers and index scores were recorded and analysed statistically. Results: The results of the study showed that nearly 90% of patients were unaware about gingival health, 2/3 of them practices prolong brushing, and 2/3 of them practiced scrub method of brushing. Despite given with instructions, most of them are reluctant in practicing them strictly. Conclusion: The knowledge, attitude, and practice on gingival health among orthodontic patients were poor as per the study, which explored the need of intense programmes to educate and motivate the patients in the gingival health maintenance. Aim: The purpose of the study was to assess the impact of educational qualification and socioeconomic status (SES) on oral health perceptions and practices in a south Indian population. Materials and methods: A multicentric questionnaire based study was performed among 600 people with periodontal disease who visited dental hospitals. Questions regarding oral hygiene practices, reason for dental visits and access to dental care were evaluated based on educational qualification and socioeconomic status. Statistical analysis was done with SPSS 10.0, using descriptive statistics, t-test and Pearson's chi-square test. Results: More than SES, educational qualification (twice daily habit of tongue cleaning [24.1%] and mouth rinsing [48.5%]; p<.05 practiced among graduates) significantly affected oral hygiene practices and frequency of routine dental visits (32.09% graduates reported for regular dental check up). Most of the study subjects practiced oral hygiene measures for cleanliness of mouth (68%) and as daily routine (24%) irrespective of their education or SES. Background: In periodontal disease, detection of inflammatory lesions in gingival tissues is essential for diagnosis and monitoring therapeutic effectiveness. Both visual signs of inflammation and bleeding on stimulation are clinically used for evaluating interdental gingival status and have been shown to be correlated with the presence of an inflammatory cell infiltrate in gingival tissue. Objective: The objective of the study was to explore the associations between bleeding and visual signs of interdental gingival inflammation and to evaluate which bleeding index i.e. Eastman interdental bleeding index (EIBI) and Papillary bleeding index (PBI) is more sensitive for detecting these interdental lesions. Materials and Method: The study population consisted of 50 male dental students aged 18 through 30 years. Each interdental site on the facial and lingual/palatal (excluding third molars) was examined for visual signs of inflammation and gingival bleeding by utilizing two bleeding indices (EIBI, PBI) which were performed on alternate sides of the mouth on every other subject. Results: In our study visual examination, EIBI, PBI detected 58.6%, 86.07%, 79% of inflamed interdental gingival sites respectively. In comparative assessment of different regions of oral cavity, EIBI has detected higher percentage of inflamed interdental sites in lingual and posterior locations in oral cavity than visual examination and PBI method. Conclusion: The results of the present study emphasize the importance of bleeding determinations for assessing interdental gingival status and EIBI found to be more sensitive indicator for detecting interdental inflammatory lesions than PBI. Osteoporosis is a disorder of the skeletal system characterized by weakened bone strength, which results in an increased risk of fracture. Osteoporosis integrates two main features: bone density(usually expressed as grams of mineral per area or volume) and bone quality (architecture, damage accumulation and mineralization of the bone). Although osteoporosis is more prevalent in postmenopausal women, it can strike at any age and affects both men and women. Periodontitis is an inflammatory disease caused by bacterial plaque which destroys the bone supporting the teeth. Currently, there seems to be a positive correlation between osteoporosis and thinning of the jaw bone. However, further investigation is warranted to better understand the exact nature of the link between osteoporosis and oral health. In dentistry, esthetics has a special place. Although gingival melanin pigmentation does not present a medical problem, clinicians are often faced with a challenge of achieving gingival esthetics. Melanin pigmentation of the gingiva occurs in all races. Melanin, a brown pigment, is the most common cause of endogenous pigmentation of gingiva and is the most predominant pigmentation of mucosa. Gingival hyperpigmentation is seen as a genetic trait in some populations and is more appropriately termed physiologic or racial gingival pigmentation. This problem is aggravated in patients with a "gummy smile" or excessive gingival display while smiling. Gingival depigmentation is a periodontal plastic surgical procedure whereby the gingival hyperpigmentation is removed or reduced by various techniques. The first and foremost indication for depigmentation is patient demand for improved esthetics. Various depigmentation techniques have been employed, with similar results. Selection of a technique should be based on clinical experience and the individual's preferences. Removal of gingival melanin pigmentation should be performed cautiously and the adjacent teeth should be protected, since inappropriate application may cause gingival recession, damage to underlying periosteum and bone, delayed wound healing, as well as loss of enamel. Aim: To develop a test for the screening of pregnant women for periodontitis using saliva prior to a dental examination. Methods: A cross-sectional research design was employed. Whole unstimulated saliva was collected from 100 pregnant women prior to a dental examination. Levels of activity of lactate dehydrogenase (LDH) and alkaline phosphatase (ALP) in the saliva were measured. The data were compared with Community Periodontal Index of Treatment Needs (CPITN) scores. The diagnostic performance of LDH and ALP was determined in terms of sensitivity, specificity, and the area under receiver operating characteristics (ROC) curves. Results: Of the 100 pregnant women surveyed 10% were healthy, 35% had gingivitis and 55% had periodontitis. When a cut-off value of 515 IU/L for LDH and of 120 IU/L for ALP, as determined by a ROC analysis, were applied, periodontitis was detected significantly more frequently in the pregnant women whose activity levels were above these cut-off marks. Also the area under ROC curve indicated that LDH level is a better predictor for periodontal status (sensitivity 85.5%) than ALP level (sensitivity 81.8%).LDH level of 515 unit is the optimal cut off point for the prediction of periodontitis status (Sensitivity 85.5%, Specificity 93.3% and over all Accuracy 89%). Conclusion: Both LDH and ALP levels can be used for the purpose of screening as there is a significant activity of both the enzymes during periodontal diseases. The picture of the mother giving birth "early" due to a sudden external stressor is well known by the layperson. The true causes of this event and how it progresses are only now becoming more fully understood. This paper addresses the problem of adverse pregnancy outcome in relation to periodontal disease. There is compelling evidence that a link exists between pre-term low birth weight (PLBW) and periodontitis. Although 25% to 50% of PLBW deliveries occur without any known etiology, there is increasing evidence that infection may play a significant role in pre-term delivery. A model explaining the plausible relationship is proposed based upon the concept of infection leading to a cascade of inflammatory reactions associated with pre-term labour and periodontal disease. Considering the fact that periodontal infections are both preventable and readily treated, these findings provide new opportunities for early intervention strategies to reduce the incidence of preterm low birth weight. This paper reviews the potential association between periodontal infection and adverse pregnancy outcomes. Stress occurs when people perceive a demand to be greater than the resource. Software professionals who toil for long hours in their work develop a lot of mental stress. Bruxism an unknown phenomenon for software professionals seems to be on the rise. Therefore this study was done to evaluate the prevalence and awareness of bruxism among software professionals. 450 employees were randomly selected from Ascendas, Tidel Park, Chennai forming sampling units from whom the data was collected with the help of a questionnaire. The results showed that 30% of the population had altered sleep pattern and 20% noticed disturbing tooth grinding. The experience of muscular discomfort on awakening was stated by 25.6% of the population and 3.4% of the population had surface irregularities of lips, cheeks and tongue with about 9% experiencing pain or locking of jaws. The study concluded that bruxism found in the IT Professionals is on the rise. Therefore, efforts should be undertaken to control this occupational hazard by providing appropriate dental treatment. Dentin hypersensitivity is a painful dental condition often left untreated. Prevalence of dentin hypersensitivity in the adult population can range from 8 to 30 per cent, with the majority of the sufferers between 25 and 45 years of age. Therefore, a clinician will see, on an average day, between one and three patients who show varying degrees of sensitivity. The condition is slightly more prevalent in women and periodontally involved patients. With the population aging and keeping their teeth longer, there is an increased incidence for dentin hypersensitivity, recession and periodontal disease. The exact mechanism of pain transmission from the tooth surface to the pulp has not been completely proven Various treatment methods have been tested, including the application of desensitizing agents, anti-inflammatory substances, iontophoresis, and neodymium-doped yttrium aluminium garnet (Nd:YAG) and erbium:YAG (Er:YAG) lasers, as well as conventional treatments utilizing composite resins and dentin adhesives. This article aims to review this enigmatic clinical entity and provide an evidence based approach to management. Objectives: The aim of the present study was to assess the periodontal health status of three classes of rural Indian patients and correlate with its impact on the life quality utilizing instrument usually employed to measure OHRQoL Methods: Periodontal examination using WHO criteria was carried out in three classes of rural Indian subjects viz. tribals (N 107), villagers ( N 123) and teacher trainees (87). Patient characteristics were obtained from a socioeconomic questionnaire and perceived oral health was measured by a single question which required them to state how they could describe health of their teeth and gums. OHRQoL was assessed by a questionnaire consisting of six questions related to psychosocial parameters . Results: None of the subjects in all the three groups related their oral health as excellent. Very fe i.e 6.89 %, 1.62 5 % AND 13.79 % in group A, B and C respectively had all six sextants free from periodontal disease but still did not rate their oral health as excellent. Loss of periodontal support was perceived as poor in Tribal group but such association was not reflected in socially educationally better placed group B and C subjects. Majority of the individuals, in spite of having considerable periodontal disease burden answered 'never' when questions were asked about influence on eating, relaxing, going out etc. Conclusion: most of the subjects in all the three groups did not correlate their poor periodontal status with any key areas of life. In spite of periodontal problems, majority of the subjects were of the opinion that their dental/periodontal status did not seem to affect their social life. They were not able to comprehend the questionnaire and instruments designed for assessment of OHRoL and impact of oral health on psychosocial parameters are not relevant to poor and illiterate and seem to be appropriate for the affluent and entirely different social class of people. Scientific advances in the creation of restorative biomaterials, in-vitro cell culture technology, tissue grafting, tissue engineering, molecular biology, and the human genome project provide the basis for the introduction of new technologies into dentistry. Recently, there has been a great interest in periodontal regeneration techniques in maintaining the physiologic structure of tissues. Most scientists and clinicians believed that damaged or diseased human tissue could only be replaced by donor transplants or with totally artificial parts. Periodontal regeneration promises a more advanced approach in which organs or tissues can be repaired, replaced or regenerated for more targeted solutions. Available methods of periodontal regeneration are unable to achieve ideal regeneration. This review briefly discusses gene therapy, platelet rich plasma and stem cell based tissue engineering, which may have promising results in achieving complete regeneration. Edentulous persons are not able to masticate food properly. Over a long period of time these individuals develop dyspepsia related symptoms. But when the missing teeth are replaced, the dyspepsia symptoms disappear. The purpose of the study was to involve medical practitioners and make them aware of seeking dental consultation for patients suffering from dyspepsia, when no other etiology could be established. Periodontology has a rich background of research and scholarship. Therefore efficient use of this wealth of research data needs to be a part of periodontal practice. As clinicians, we must be able to recognize the different levels of evidence because they allow us to assess the value of the information provided. The evidence-based approach helps to ensure that efficacious treatments are used in practice. This approach does not ignore the patient and concentrate solely on numbers and statistics. To contrary, the evidence based approach recognizes the importance of patient preference and quality of life. Evidence base Periodontology aims to facilitate such an approach, accelerating the introduction of the best research into patient care. The purpose of this article is to describe the evidence based approach in diagnosis and treatment of periodontal diseases. Aim: This study was conducted to determine and compare the oral hygiene status, the prevalence, extent and the severity of gingivitis and periodontitis in persons with Down's syndrome and healthy individuals. Methodology: The study group consisted of 44 individuals with Down's syndrome and 44, age and gender matched healthy controls aged 13- 30 years. The Simplified Oral Hygiene Index, Gingival Index and the loss of attachment were determined for each participant. Results: The oral hygiene status in the individuals with Down's syndrome was significantly poorer than the healthy individuals. Within the Down's syndrome group the older individuals had a poorer oral hygiene and a greater extent and severity of gingivitis and periodontitis. The individuals with Down's syndrome had a significantly higher extent and severity of gingivitis and higher prevalence, extent and severity of periodontitis than the healthy individuals. Conclusion: The observations made in this study suggest that the Down's syndrome individuals require special preventive and therapeutic strategies to establish and maintain a good periodontal health. Purpose of the study: To assess the motivations for choosing dentistry as a career among 1st year BDS students of Bhopal city and to better understand why students choose this occupation. Objective: To know factors related to selection of dentistry as a profession and to suggest possible recommendations. Materials and methods: A cross sectional study was conducted and 248 students participated in the study. A self administered questionnaire containing 10 items was used to assess the motivation of 1st year BDS students in Bhopal city. Results: It was found that for majority of them, (71.6%) dentistry was their 1st career choice, with medicine being the primary alternative. Among those 47.8% of them opted as courier because they were interested in dentistry and 36.3% because of family influence and majority (81.6%) of the respondents answered for name and fame, and 18.4% answered helping people and improving their appearance. Conclusion: This study is the first of its kind in Bhopal city which hence provided valuable information on choosing dentistry by choice or chance. Reasonable knowledge was demonstrated but some deficiencies were evident. Aims and objective: To know the oral health status of remand home residents. To suggest measures for improving their oral health status. Material and methods: Study population consisted of 175 of remand home residents of Mysore in the age group 5-45yrs, among them males were 29 and females were 146. Their oral health status was assessed using modified WHO proforma (1997) by using mouth mirror and CPI probe. Results: The DMFT for remand home resident was 1.5, the mean OHIS was 3.2.The mean CPI was 1.8 and 30(17%) had dental fluorosis in different grades, 34% residents are using tooth brush and paste, 1.1% residents are using brush and powder and 65% of residents using finger and tooth powder. Recommendations: To improve the oral health of these residents by approaching nearby dental institutions and dental professionals to enable them to render treatment to the residents. Aim and objectives: To assess the lifestyle among the doctors working in jss institutions. To bring about change in the existing harmful lifestyle pattern. Material and methods: All the available doctors of JSS institutions, ayurvedic, dental were surveyed with the help of self administered questionnaires. Results: Physical activity was more among ayurvedic doctors (M-80% F-75%) when compared with medical (M-43.5% F- 40.3%) and dental (M-41.3% F-35.7%). The habit of consuming alcohol and smoking among Ayurvedic doctors 53.4% Medical (M-65.3% F- 4.2%) Dental (58.6%). 41% of the medical and dental expressed that reasons for not having physical activities was lack of time. Mental stress was more among Medical doctors (M 63.0%, F-72.2%) Dental (M-72.4% F- 64.2%) compared with ayurvedic doctors (M-46.0% F-37.5%). Conclusions: Medical and Dental doctors had more backache than Ayurvedic doctors and associated with less exercise. Recommendation: All the doctors should be encouraged to practice and participate in sports. Periodical competitions should be held. A total of 474 employees in the age group of 35 - 55 years were surveyed. Aims & Objectives: To know the oral health status of the employees. To suggest suitable measures for improving the oral health status Material & Methods: The clinical examination was conducted in CFTRI auditorium by four calibrated examiners using WHO criteria (1986) Result: The results show the caries prevalence of males was 50.0% and for females 30.58%, 91.89% of males and 88.7% of females had periodontitis. 9.48% of males and 10.7% of females had dentures. 34.5% of males and 20.6% of females had unmet denture need. Conclusion: The prevalence of dental caries and periodontal status of CFTRI employees was no better than that of general population, in spite of high socio-economic status and high literacy rate as they have unmet dental care. Mutans streptococci are shown to be highly associated with caries in humans. The bis-biguanide chlorhexidine, which has been studied extensively for over 25 years, is currently the most potent antimicrobial agent against mutans streptococci and dental caries. The most persistent reduction of mutans streptococci has been achieved by chlorhexidine varnishes, followed by gels and mouthwashes. The main clinical problem observed in many studies was the difficulty in suppressing or eliminating the mutans streptococci for extended periods. After treatment, these organisms proliferated and re-colonized the dentition. Reappearance of mutans streptococci is a clinical problem, which emphasizes the need for continued research into effective antimicrobial means of preventing dental caries. There is a lack of consensus on evidence-based treatment protocols and controversy regarding the role of chlorhexidine in caries prevention among oral health providers. Chlorhexidine use for caries prevention should be studied further to develop evidence-based recommendations for their clinical role in caries prevention. Background: Oral health is often considered as a probable source of health inequalities in persons with neuromotor and mental deficiencies. Numerous studies reported poor oral health in subjects with disabilities, with this background present study aimed to assess and compare the oral health status and treatment needs of institutionalized special subjects. Methods: A descriptive cross sectional study was undertaken. Oral health status was recorded using WHO 1997 criteria with modifications including OHI-S index. Body mass index was calculated by measuring height and weight. Results: 141 subjects participated in the study, of which 48 were special subjects and 93 were normal subjects. 52.08% of special subjects and 74.15% of normal subjects belonged to 10-13yrs age group. Gender distribution was equal in both categories with maximum percentage of males. Special subjects had poor Oral hygiene with a mean OHI-S scores 2.9 1.5 than those of normal subjects with a mean OHI-S score 2.7 0.66. Mean caries experience of 3.01 teeth per individual was observed among special subjects compared to 0.55 teeth per individual in normal subjects .When BMI for age was compared, 49.4% of normal subjects were under weight, where as it was only 5% for special subjects. It was noted that 80% of special subjects were normal weight, where as it was only 35.4% for the normal subjects. Conclusion: Poor oral health was a major problem for special subjects. This may be related to the low physical and mental abilities of these individuals and consequent difficulties in maintaining oral hygiene. Special Care Dentistry is concerned with the improvement of the oral health of individuals and groups in society who have a physical, sensory, intellectual, mental, medical, emotional or social impairment or disability or, more often, a combination of a number of these factors. The differently abled is a wider term which includes all those children who suffer from malformations, deformities and other deficiencies - physical or mental which prevent their normal functioning. In this article we report a follow up study of three cases with special care needs. 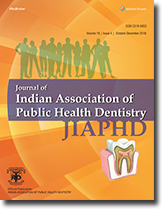 A study was conducted to assess the knowledge and attitude about dental diseases and their prevention among primary and middle school teachers of urban and rural areas of Bangalore district, their source of health information, their role in promoting oral health and to plan appropriate teacher training programs and guiding school education programs that might be utilized to rise oral health awareness. Study population comprised of 1300 teachers (750 urban and 550 rural teachers). The study results revealed that rural teachers had better knowledge compared to urban teachers, which is surprising finding because it is general belief that rural population are not having knowledge and awareness compared to urban population. The study showed that overall knowledge of school teachers was only 29.3%. The rural teachers had better knowledge which was 33.8% compared to urban teachers which was 26%. Overall attitude was better than knowledge in both groups. Several deficiencies in the expected knowledge and attitudes in urban and rural teachers, will act as a challenge to the progressive education, stimulating him/her to include teaching about basic dental facts in the school curriculum. Increasing the oral health knowledge of the school teachers provide an opportunity to educate an important segment of the public that has access to large population of young people. Access to oral health is a complex issue involving barriers as diverse as inability to afford services, unavailability of services, transportation problems, cultural preferences, language hindrances and so forth. Adding to these barriers is the dentists' attitude and perceived comfort in treating the underserved. This article brings out the importance of including outreach programmes in the curriculum for dental students to reinforce desirable attitude in future dental professionals regarding treating the underserved segments of the population. Student perceptions of such outreach training programmes already in existence are outlined. The challenges faced while organizing such programmes are also highlighted. Objective: To assess the prevalence of traumatic dental injuries to permanent incisors among 12 years old school children in Tandoor, Andhra-Pradesh. Materials and method: A cross-sectional survey using the WHO classification of tooth fracture (1978) was conducted on randomly selected 1020 school children to assess the dental trauma to permanent incisors. Results: The prevalence of traumatic injuries was 15.1%, which was more among boys than girls. The main reason that resulted in dental traumatic injury was fall, followed by collision, children with excessive overjet etc. Conclusion: The prevalence of traumatic dental injuries in Tandoor is significantly more and summons the public health attention. Back Ground: The recruits after selection and initial training are posted in peace and field units spread all over the country. Some of units are at or near the borders at rough and tough places like glaciers, jungles and snow covered mountains where dental treatment is not readily available. Aims & Objectives: To assess the oral health problems, oral habits and examination of dental standards of recruits in Belgaum city. (a) To assess the oral health status of Army recruits in Belgaum. (b) To know the oral hygiene practices & oral habits among recruits. (c) To assess the present pattern examination of dental standards at Army Recruitment Centres. Material & Methods: The study included a total of 1254 recruits out of which 806 recruits were from Maratha Light Infantry Regimental Centre (MLIRC), who had already been selected and undergoing training. They were compared with 448 recruits from Branch Recruiting Office (BRO) who had recently reported from civil background for recruitment. The WHO oral health assessment form 1997 was modified & used in the study. Results: It was observed that 70.80% MLIRC recruits were using toothpaste and toothbrush. 12% of recruits were found having tobacco habits. 48% recruits who were recently selected were found having periapical abscess in relation to teeth which were decayed but given permanent restorations. Conclusion: Quid keeping and pan & betel nut chewing habit has been found to increase in men due to commercial advertisement and readily available tobacco and pan masala products. Suitable lectures should be given to emphasize the harmful effects of these habits. Background Most of the Indians are enjoying an increasing level of health care from last two decades. However, oral health improvements are not being experienced equally, compared to general health. The poor, rural residents and other groups do not have adequate access to dental care. Overview: The author discusses the need to understand clearly the barriers to care affecting underserved populations and presents a framework for improving dental service utilization. Conclusions: The author concludes that utilization problems are complex and will not be solved easily or quickly. A complete understanding of the barriers to care being experienced by any group under consideration must be achieved, and an improvement plan must be designed to address those specific barriers.